Debugging an embedded Web Browser control in a Windows application can be a pain. The Web Browser control is essentially an embedded instance of the Internet Explorer engine, but it lacks any of the support (F12) tooling for debugging. But if you need to debug more complex code, using Console based output can only get you so far. A few days ago I had introduced a regression bug into the spell checking code in Markdown Monster and man was it tricky to debug. Console debugging had me running in circles. I vaguely knew that Visual Studio can debug Internet Explorer code, but didn't put the pieces together to see how to do this with my own applications like Markdown Monster that are running an embedded Web Browser control. It didn't occur to me because standalone Windows projects like a WPF app don't offer script debugging as part of the debugging UI. You can start up Visual Studio and attach a debugger to an already running application that hosts the Web Browser control and specify you want to debug Script code. This works, but it's a bit tedious because you need to explicitly attach the debugger to a running process to do it. But since you are attaching to a process, it works with any kind of EXE application not just .NET applications, and it works even if you can't change and set breakpoints in the script code. The Web Browser control is essentially embedded Internet Explorer so Internet Explorer's options determine Web Browser behavior as well. One of the options available allows you enable script debugging. Actually it's more like disable the disable script debugging default option 😃. Once enabled you can set debugger breakpoints in your script code and force a dialog that lets you choose the debugger you want to use. and that should plant you right at your breakpoint in Visual Studio. Once the debugger is attached, Visual Studio automatically tracks any scripts that are running in a Script Documents section in the Solution Explorer and you can open the document from there. Markdown Monster uses HTML for the Markdown editor and also the preview so both of these pages and their scripts show up in the Script Documents section immediately. Once you have a breakpoint set you can examine variables and drill into objects just like you'd expect to do in Visual Studio. Watch where you make Code Changes! If you look at my screen shot you can see that the script file debugged is open and I can edit this file and make changes - if I reload the page (or open a new document in Markdown Monster for example) the change shows up in the executing code. But be aware that the path to the script file will be in the application's deployment folder, not the file that might live in your project. When you debug with the Visual Studio debugger, the files in Script Documents are the actual files running, which are in the deployment folder (ie. \bin\Release). So if you make changes to a script file, make sure you copy those changes back to your project folders after you're done debugging or else the changes are simply overwritten the next time you compile your project. I say this because I've done this more than a few times in the past - debugged my files made some changes, then recompiled the .NET project and: Faaaark!, I just overwrote my changes. Don't let that happen to you. After I hooked up the debugger in Visual Studio I found my Spellcheck issue in Markdown Monster in a matter of a couple of minutes after previously spending well over an hour with trying to find the right console.log() calls to try and trace down the bug. Internet Explorer Options setup is probably a better way if you control the script code you are debugging as you can just enable it and set breakpoints with debugger statements to get into Visual Studio to debug. I find myself using this approach now primarily, after I forgot how to get that enabled in the IE options (thanks to Ian's comment). 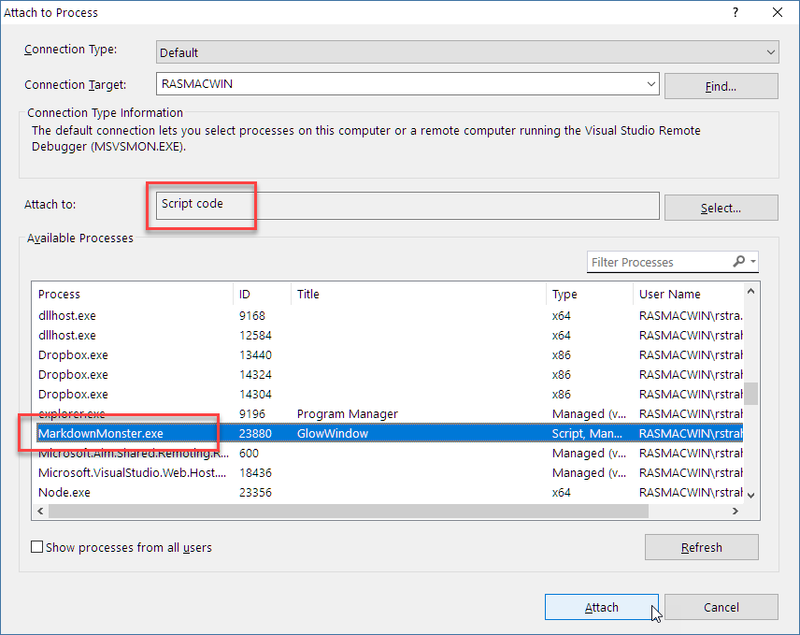 What would be even nicer if Visual Studio allowed you to debug Script code as part of running a .NET application, but that option sadly is not available so one of the other approaches is needed to get into Visual Studio's script debugger. Awesome! Thanks to @Donnchadha for pointing me in the right direction. Make sure script debugging is enabled in Internet Explorer (and restart IE and your app with the WebBrowser control if it was running). 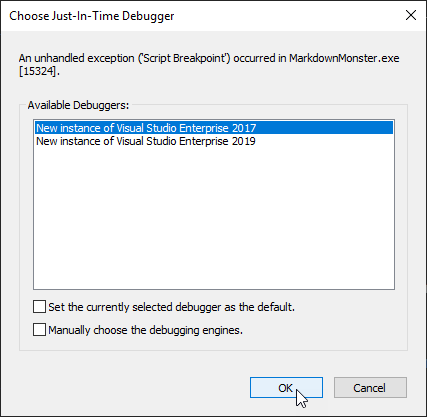 When it hits the debugger statement it should pop up the dialog that asks if you want debug using the current instance of Visual Studio, etc. I have a WinForms app which uses a WebBrowser control which loads an html file using file:\ which loads a third party html editor. I don't see "Script Documents" in Solution Explorer during debugging. Won't this show only for web projects? Isn't MarkdownMonster a WPF app which is like Winforms (both are desktop apps) so come it's showing for you? I've had the same trouble in the past trying to debug embedded script in a .NET application. 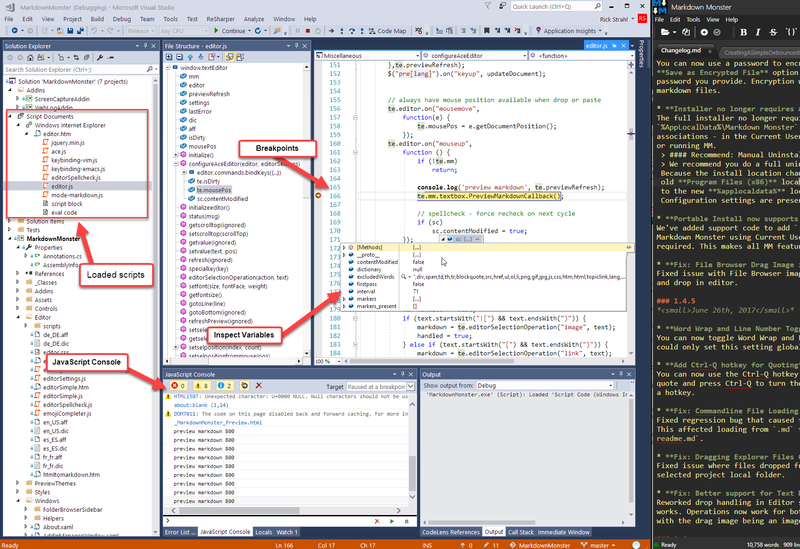 You can actually make it even easier to debug embedded script by creating a C++ "Empty Project" in Visual Studio. You can then have the project set to run an external application, like the build output from another project in your solution, and set the C++ project to debug Script directly. Finally, set the C++ project as your Startup project. It takes a couple minutes to set up, but at the end, you can just F5 your solution, set a breakpoint in your script, and watch it break right where you want it to. Of course, the downside to this approach is that you have to have the Visual C++ components installed. 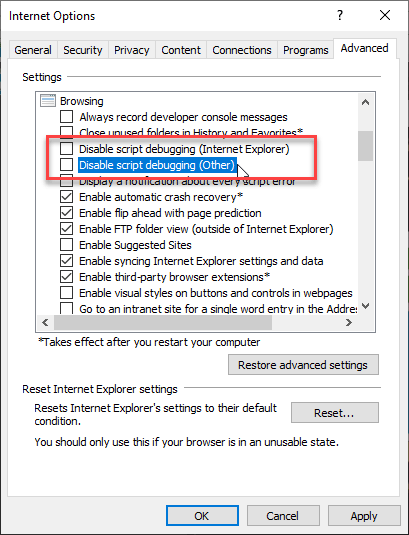 Before script debugging will work, you may need to go into the Internet Explorer options and turn off "Script Debugging" in the Advanced tab. Hmmm... works for me without that. I think Visual Studio sets that somehow, although it might require running under Admin to get that to work.